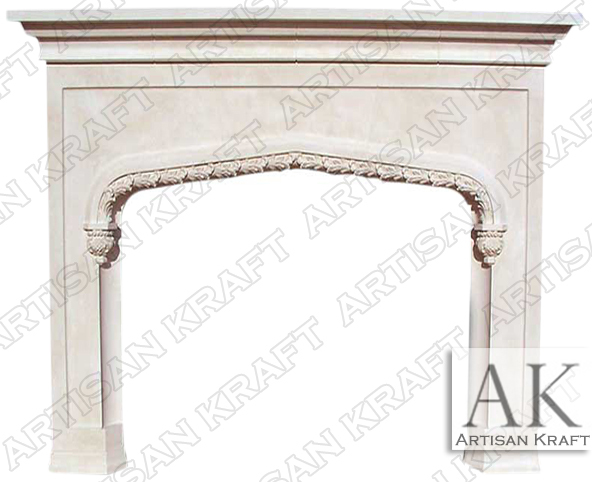 Rose Tudor is an English fireplace mantel made from limestone. This Tudor is different from others because the peaked arch opening has a leaf design. The frieze is also panel versus a detailed inlay. The mantel shelf frieze inlay can be decorated with roses, vines and shields. Oak or maple leaves can also be carved into the inlay. This surround can also be made from marble and cast stone. Sandstone is another great option. Limestone fireplaces are available for a quick delivery from our stock. Shop our large selection of sale mantels. Click around or follow the links to view more Gothic and Tudor style mantels. Stone: Marble, limestone, sandstone, cast stone, travertine etc. Available in many different colors, textures and finishes.